Zion Research has published a new report titled “Baking Ingredients Market by Type (Leavening Agents, Fats & Shortenings, Colors & Flavors, Baking Powders & Mixes, Emulsifiers, Starch, Enzymes, Oil and Other Types) for Cakes & Pastries, Bread, Rolls & Pies, Biscuits & Cookies and Other Application: Global Industry Perspective, Comprehensive Analysis and Forecast, 2015 – 2021” According to the report, global demand for baking ingredients market was valued at over USD 11.80 billion in 2015, is expected to reach above USD 15.73 billion in 2021 and is anticipated to grow at a CAGR of slightly above 5.0% between 2016 and 2021. Baking ingredients enhance the process of baking by improving flavor, taste, and texture. Baking is the technique in which the food is baked using prolonged heat followed by radiation and convection. Yeast, flour, egg are some of the widely used basic baking ingredients for baking. 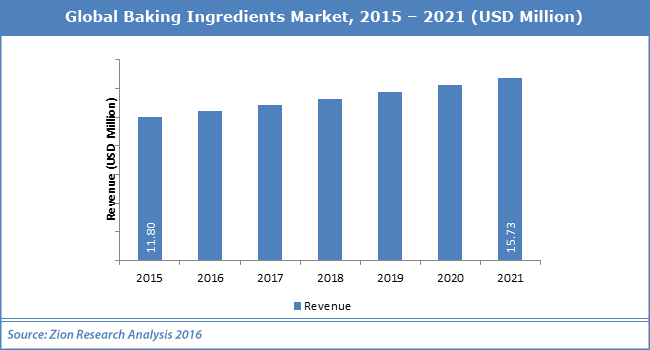 The baking ingredients market is primarily driven by rising demand for processed and baked products. Moreover, increase in population results in growing demand for food. Changing lifestyle coupled with escalating dual and discretional income stimulates the growth of this market. Furthermore, rapidly growing food chain industry trigger the growth of the baked ingredients market. There has been a huge reluctance for cooking on a daily basis in the developed countries which triggers the growth of the market. However, baked products with partial shelf life may hamper the growth of the baking ingredients market. Nevertheless, the introduction of innovative baked products with high nutritional value is likely to open a new avenue for the baking ingredients in the market. Also, vigorously rising demand for baked, processed and packed food from the developing economies may positively impact the growth of the market in the estimated period. Based on the type, the baking ingredients market can be segmented as leavening agents, fats & shortenings, colors & flavors, baking powders & mixes, emulsifiers, starch, enzymes and oil among others. Starch is leading segment owing to high demand and use in the baking process. A number of applications for baking ingredients include cakes & pastries, bread, rolls & pies, biscuits & cookies and other applications. Bread is the most extensively consumed product on a daily basis in the developed countries. Biscuits and cookies are also considered as a potential market segment. North America and Europe are considered to be the most prominent markets for the baking ingredients. This mainly attributed to the rapidly growing consumption rate of baked food in this region. A hectic lifestyle is also another factor contributing to the splendid growth of the market in North America and Europe. Asia Pacific is witnessing unprecedented boom in recent times and is likely to maintain its pace due to growing food chain and escalating demand for baked, processed and packed food particularly in India. Latin America exhibits decent growth owing to increasing disposable income. The Middle East and Africa is anticipated to experience sustainable growth in the coming years due to rapidly changing lifestyle. There has been intense competition leading the players to primarily focus on research and product development to sustain in this market. Associated British Foods Limited, Cargill, Inc, Royal DSM N.V., Kerry Group plc, Corbian N.V., British Bakels Ltd, Muntons plc, AAK UK, Dawn Foods Ltd, Taura, CSM, Caravan Ingredients, crust ‘n’ crumb food ingredients Pvt Ltd. and Empire Baking Company among others are some of the leading players in the baking ingredients market.